Abstract. Fram Strait is the main gateway for sea ice export out of the Arctic Ocean, and therefore observations there give insight into the composition and properties of Arctic sea ice in general and how it varies over time. A data set of ground-based and airborne electromagnetic ice thickness measurements collected during summer between 2001 and 2012 is presented here, including long transects well into the southern part of the Transpolar Drift obtained using fixed-wing aircrafts. The primary source of the surveyed sea ice leaving Fram Strait is the Laptev Sea and its age has decreased from 3 to 2 years between 1990 and 2012. The thickness data consistently also show a general thinning of sea ice for the last decade, with a decrease in modal thickness of second year and multiyear ice, and a decrease in mean thickness and fraction of ice thicker than 3 m. Local melting in the strait was investigated in two surveys performed in the downstream direction, showing a decrease in sea ice thickness of 0.19 m degree−1 latitude south of 81° N. Further north variability in ice thickness is more related to differences in age and deformation. 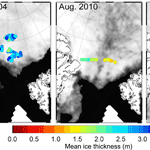 The thickness observations were combined with ice area export estimates to calculate summer volume fluxes of sea ice. While satellite data show that monthly ice area export had positive trends since 1980 (10.9 × 103 km2 decade−1), the summer (July and August) ice area export is low with high uncertainties. The average volume export amounts to 16.78 km3. Naturally, the volume flux estimates are limited to the period when airborne thickness surveys are available. Nevertheless, we could show that the combination of satellite data and airborne observations can be used to determine volume fluxes through Fram Strait and as such, can be used to bridge the lack of satellite-based sea ice thickness information in summer. How to cite: Krumpen, T., Gerdes, R., Haas, C., Hendricks, S., Herber, A., Selyuzhenok, V., Smedsrud, L., and Spreen, G.: Recent summer sea ice thickness surveys in Fram Strait and associated ice volume fluxes, The Cryosphere, 10, 523-534, https://doi.org/10.5194/tc-10-523-2016, 2016.